The Darkness represents a whole new approach to sit&switch single racing canoes. It is developed, designed and manufactured in Great Britain from carbon fibre, making it very strong, light and incredibly good looking. The slim hull design delivers exceptional speed and a zero rocker along the keel line enables outstanding directional stability in a straight line. The Darkness offers kayakers a transition boat to the dark side which does not compromise on speed. 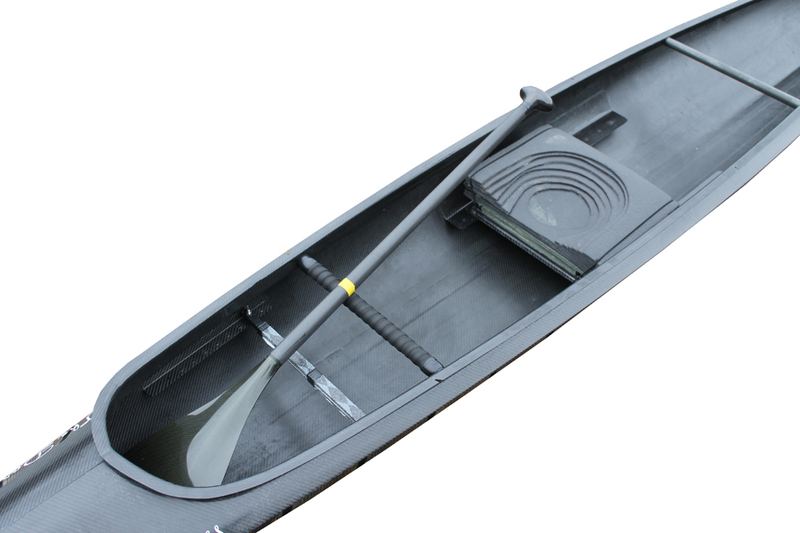 It can be paddled equally as well with kayak blades without the complications of a rudder or enclosed cockpit. For canoeist who have paddled touring or wilderness vessels, here is an opportunity to stay with a single blade but move to a faster boat. Dragon boat paddlers can take their skills to The Darkness enabling solo training and an added dimension to their sport. 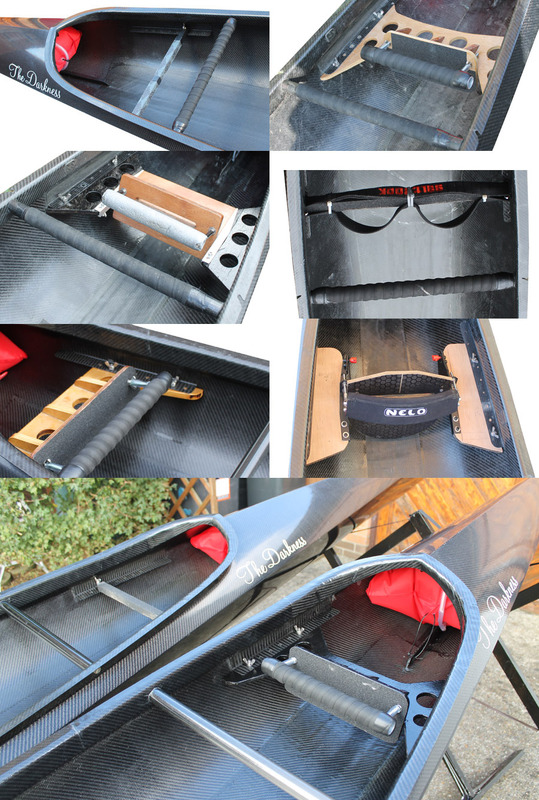 Quadrathon athletes, here is a training and racing boat which doesn't require the mastery of a racing K1. Triathletes, cyclists, runners, yachtsmen, skiers, swimmers and anyone who wants to maintain upper body strength, this is your route to the unique sensation of being at one with the water. 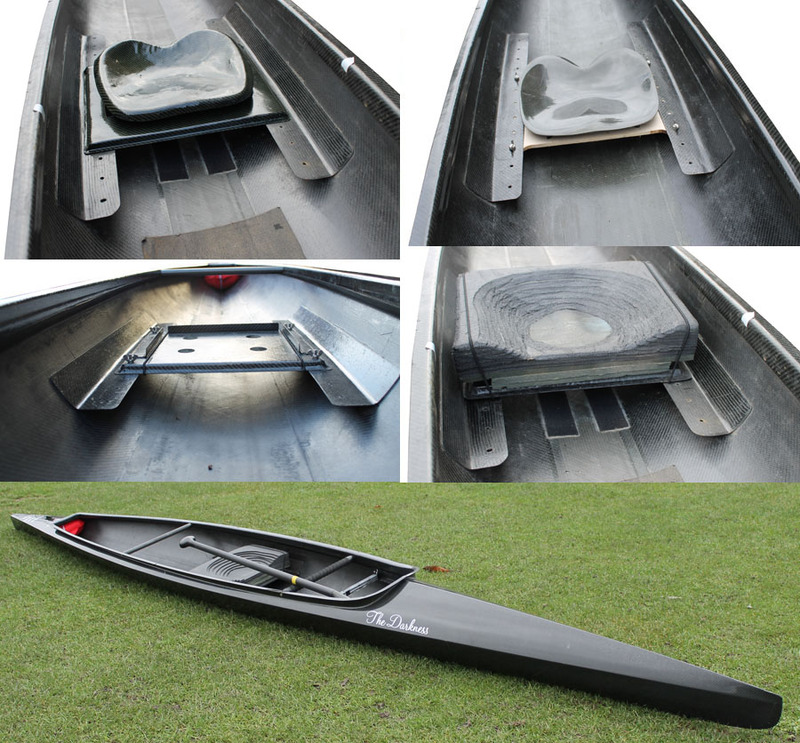 The Darkness has been designed and manufactured from a paddlers point of view and has many features which contribute to the whole canoeing experience. The Darkness is expensive to build but currently, only costs £1,800 to buy. There are no “club rates”, discounts for bulk, charity concessions or “mate’s rates”, just one price for a clear finish, top spec, vacuum infused, carbon fibre racing boat. The Darkness is manufactured using a vacuum infusion technique. This is where the dry carbon fabric is layered into the mould before the resin is introduced. A vacuum is formed between a plastic membrane and the flange of the mould, and the resin is literally sucked from one end to the other, thus “wetting” the carbon fabric with the minimum amount of resin. This ensures the lightest, stiffest boat possible, however it is resource intensive and incurs considerable wastage of consumables. 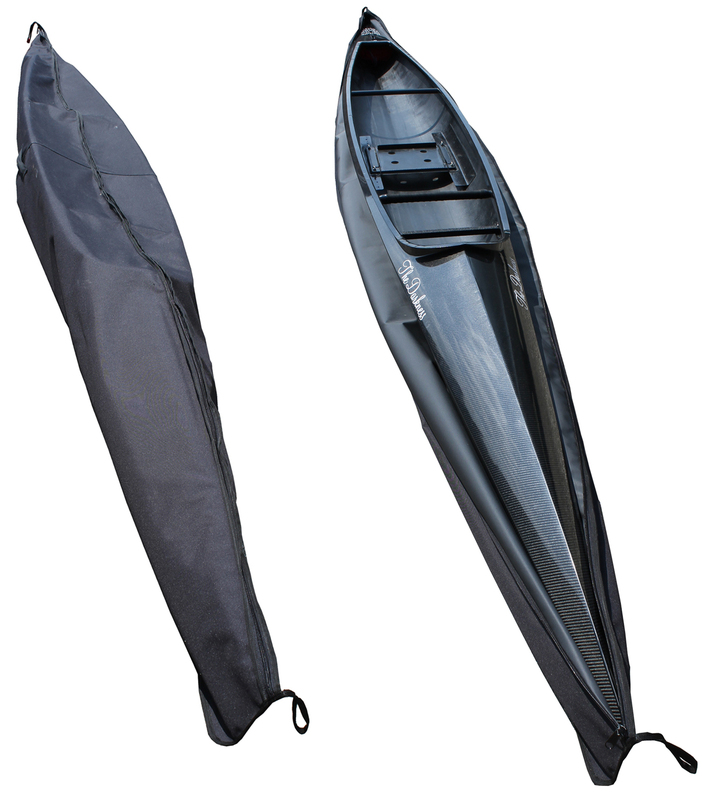 The majority of canoe and kayak manufactures only offer this construction at the very top of the range and even then, opt for the cheaper Kevlar fabrics. All kind of building materials are permitted. Sections and longitudinal lines of the hull shall not be concave (only horizontally and vertically). The canoe must be built symmetrically upon the axis of its length. Steering rudders or any guiding apparatus directing the course of the canoe are not allowed. A keel, if any, must be straight, shall extend over the whole length of the canoe and shall not project more than 30 mm, below the hull. The C1 and C2 may be entirely open. The minimum length of the opening shall be 280cm and the edge of the side of the craft (gunwale) can extend maximum 5cm into the craft along the whole defined opening. The boat can have maximum three strengthening bars with a width of maximum 7 cm each. Removable spray decks may be used. The Darkness has been designed and manufactured from first principles. We didn't just make modifications to an existing concept; rather we started from scratch and tested different ideas in marathon race conditions over a period of three years. Once satisfied, the last prototype was digitised and refined by a Naval Architect in CAD. The path from digitised data to production model was the responsibility of the Architect and the boat builder, both of whom have designed and built multi-hulled racing yachts. This was a deliberate strategy to avoid the risk of adopting traditional canoe building methods and creating something similar to what has gone before. As such, the join runs through the keel line rather than along the sides. The join has been strengthened in the exposed area of the cockpit with three layers of 200 grams carbon fibre. Inside the bow and stern deck areas, additional strengthening has been applied to the join. The longitudinal rigidity of the canoe has been improved along the length of the keel line. Particular attention has been paid to the seating. A lot of traditional canoes use a simple bench seat often made from wicker. Other paddler’s prefer to kneel in the boat. Canoes from the USA use a “tractor” seat and marathon kayakers opt for what can only be described as an egg cup! All these options are fine if you have a tractor or egg shaped bottom! The seat solution for the darkness is based on flexibility rather than a forced option. The carbon fibre platform is secured to the support rails by four stainless steel bolts with wings nuts. 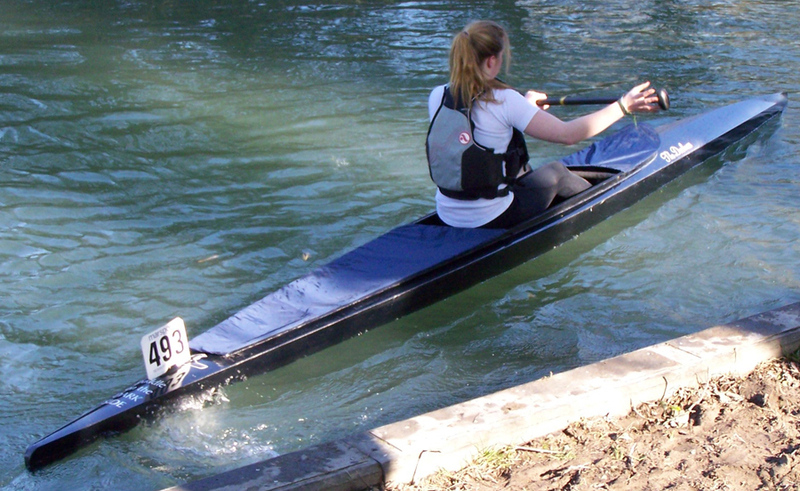 It can be moved forward and backwards to allow for paddlers of different height and weight. It enables the boat to be trimmed in the water for optimum performance. The carbon fibre platform secured between the runners also stregnthens the boat across its width. A foam base seat of any design or height is fitted between the vertical guides. Two elastics ensure that it stays secure during portages. It can quickly and easily be swapped out for one of a different height for change water conditions during a race. The telescopic footrest is made of two square section aluminium rods. It is secured to the support rails by two stainless steel bolts with wings nuts. It can be moved forwards or backwards to allow for the leg length of the paddler and for the knees to be raised to a comfortable position. It is covered with grip tape to help prevent the paddlers’ feet slipping as the paddler as power is exerted. With no closed cockpit it will cope with any size feet without the fear of tem becoming trapped. The footrest also contributes to additional cross bracing. As The Darkness is primarily a canoe, it has a large open cockpit which is not strengthened and braced by a full length deck. As such canoes have thwarts to add the rigidity normally provided by a deck. The Darkness has two carbon fibre tubular thwarts. 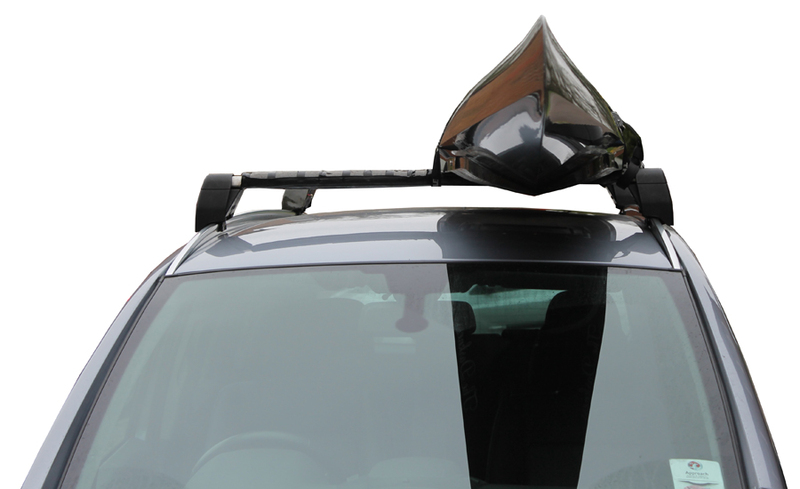 The rear one is to add cross bracing to the boat, but is also very useful to secure the boat to a vehicle roof rack for transportation. The front thwart is used to aid the paddler to embark and disembark. It is positioned to enable the paddler to pull themselves forward from sitting position to standing. It is also used for the paddler to lower themselves from standing to sitting. It can be covered with padded handlebar tape for better grip and comfort. Buoyancy is important in the (unlikely!) event of a capsize. It helps keeps the boat afloat whilst upside down. Buoyancy is provided by a 12 litre Palm Infinity heavy duty floatation airbag in the bow and a 35 litre air bag in the stern. Spray decks are normally associated with kayaks. However, The Darkness has a lip around the gunwales which enables spray decks to be employed. These examples show a small covering at the front to help prevent the drip from the paddle as it crosses the front as it is switched from one side to the other. The rear one helps prevent spay and rain entering the boat. A full cover spray deck was manufactured bty Marsport for last day of the Devizes to Westminster for the anticipated boat wash and waves on the tideway. The Darkness is easily transported on a conventional vehicle roof rack. It doesn't need the special "V" rack as it can be supported by the gunwhale, upside down on padded rails. 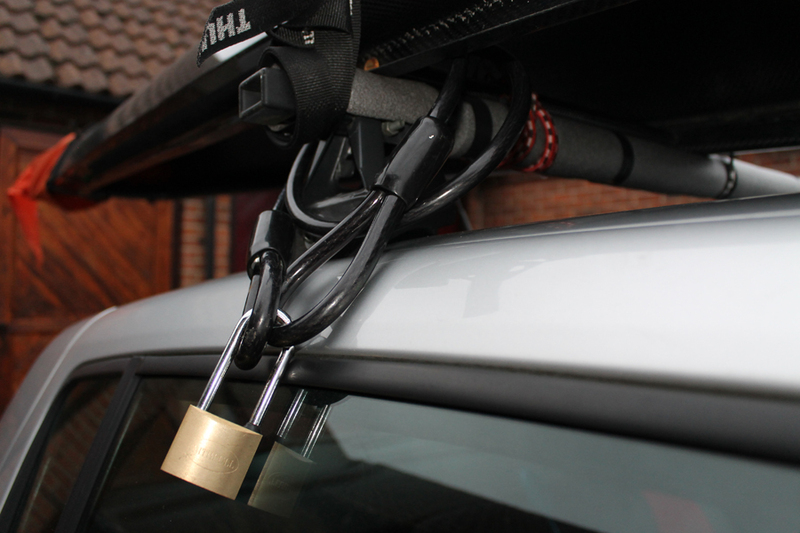 It can be secured by straps, and a bungy on the rear thwart to prevent it slipping forward or back. A standard bicycle cable and lock can secure it if necessary. The boat profile is very aero-dynamic which reduces fuel consumpsion. On smaller cars such as this Renault Clio, it is advisable to secure the bow to the front towing eye is similar. A boat bag is available for The Darkness from Marsport. It is made from heavy weight fabric and has a full length zip.